Can you be considered as an equal contributor to a track if you’re only strumming a couple verses in the background? I suppose if you’re Paul McCartney, you can.. The first time my little sister showed me this song, I thought,”sigh, another cringey pop song… I really need to teach this kid what good music is about.. “ Then, I noticed the vulnerability that Rihanna seemed to be expressing. It sounds like a rough track, so stripped down compared to all her other overdone commercial jingles. Usually, I think that Rap/Vocals tracks are so easy, and RiRi has already shown some interest in this kind of bluff, but it seems that it all just merges together here. 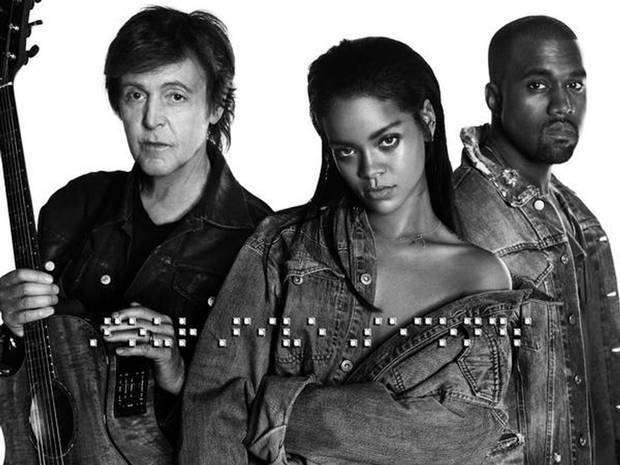 It’s like McCartney, West and Rihanna just sat down one evening with a cup of tea and recorded a really authentic and fresh song. Lyrically speaking, it seems as if the song is all about realising the mistakes you made the night before, but I feel like there’s a second feel to it with “Cause all of my kindness, is taken for weakness“, which I really like by the way. That, for me, shows the susceptibility of the song even more. It’s kind of heartbreaking, in a way. When you see someone that seems as provocative and sensuous as Rihanna, and she opens herself to the world, her feelings and concerns and thoughts and remorses. The myth of that girl that makes heads turn falls to the ground, and for that I respect her. Overall, a sensitive song about drinking and heartbreak, weaving in quite a few different genres and establishing an intense mingle of emotion. Previous Previous post: CENTURIES – FALL OUT BOY – YOU’LL LOVE IT FOR HUNDREDS OF YEARS!